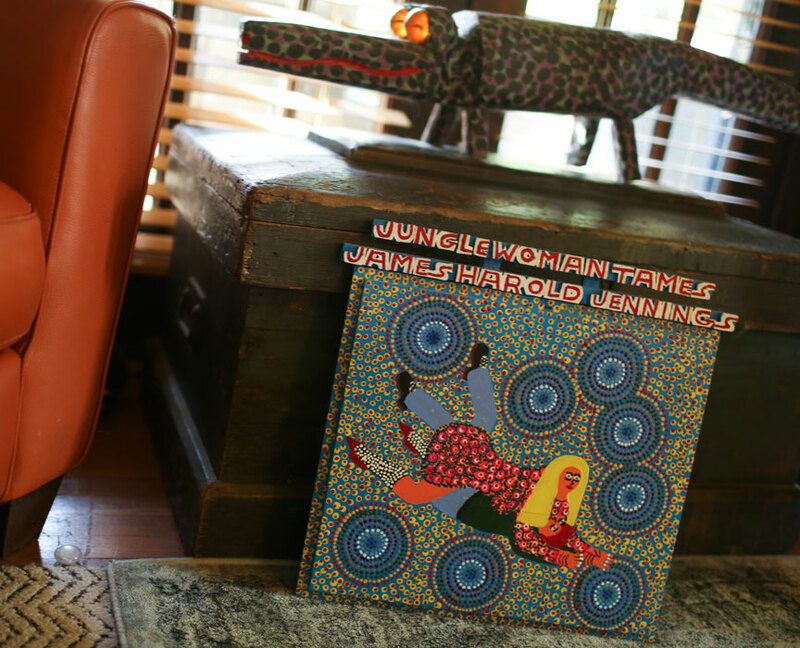 Jungle Woman (1997), by James Harold Jennings, Pinnacle, N. C. Photo by Jim Barcus. Gordon Parks (2012), by Dr. Charles Smith, Hammond, La. Photo by Jim Barcus. Clairvoyant (2010), by Ron Allen, Wewoka, Okla. Photo by Jim Barcus. 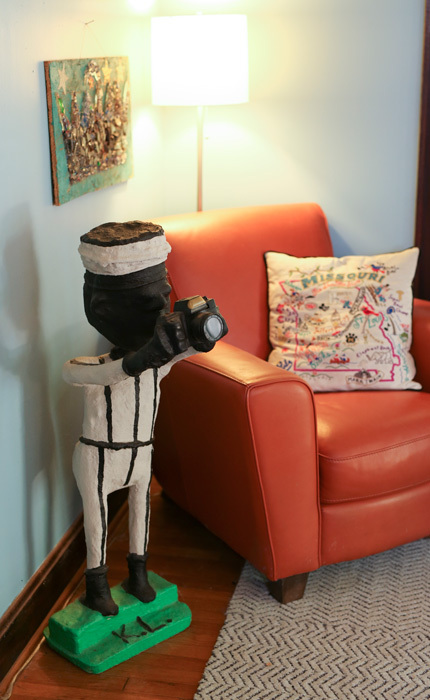 Kelly Ludwig surrounds herself with outsider art in her Kansas City home. Photo by Jim Barcus. KC collector hooked on “purity and rawness” of works by untrained artists. 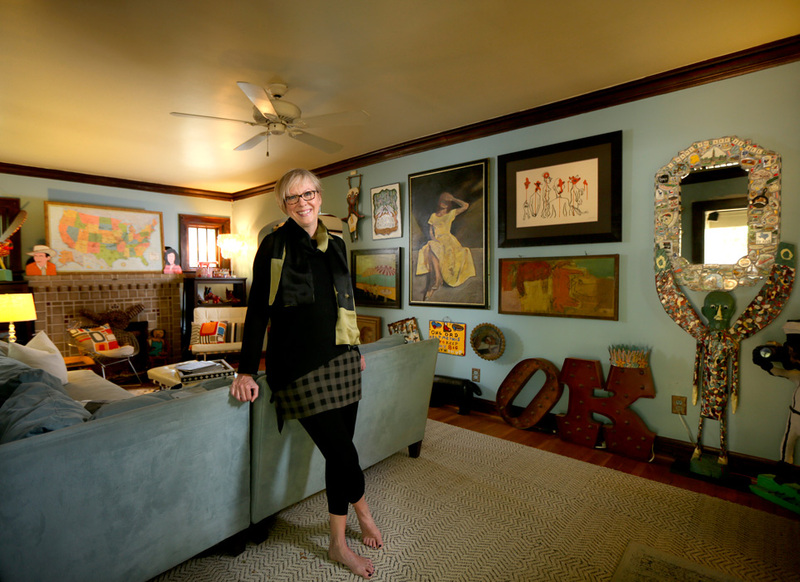 A long-time Kansas City resident, born in the Ozarks, Ludwig traces her love of outsider work to her childhood. “Unbeknownst to me at the time, I grew up with an outsider artist of sorts—my mother,” she said in a recent interview at her home. “She has one of the best eyes for art that I know of,” says John Foster, a writer for Design Observer and one of Art & Antiques 100 Top Collectors in America. And Ludwig’s collection is, literally, all around her—on the walls, shelves, tabletops and mantel. 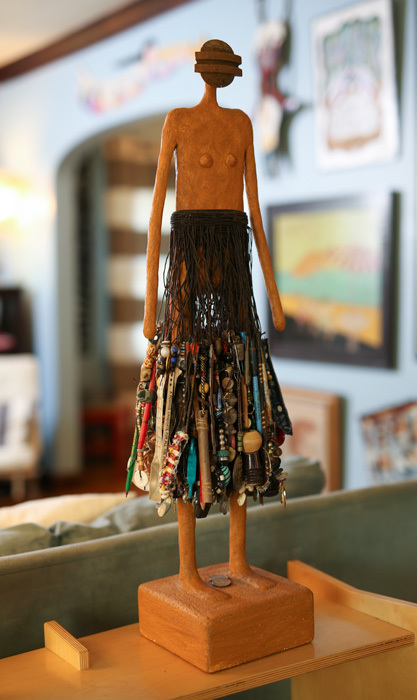 Like the outsider art it contains, the collection is eccentric and eclectic. It vibrates with energy, and pieces range from the painstakingly meticulous to the brutal and raw. A painted, wood cutout of a trumpeting angel by Howard Finster is covered with bright, childlike images and cheerful, handwritten religious messages. A few feet away a rusty, jagged-edged piece of tin bears the crudely scrawled words, “HELL IS HOT.” Both messages are influenced by faith but are polar opposites in delivery. “Kelly Ludwig is all things ‘outsider,’” says Mike Murphy, chief content officer of KCPT. “I thought I managed to collect some great stuff over the years, but my collection pales beside hers.” Ludwig was a much tapped source for Rare Visions and Roadside Revelations, a program created by Murphy, Randy Mason and Don “the Camera Guy” Mayberger, that documented outsider artists and grass roots arts. Materials used by the artists are diverse. There’s plenty of paint, but carved wood and found objects, too. A figure about a yard tall titled Bunny— though it could easily be an Aztec god or a space alien—by Clarence and Grace Woolsey, is made entirely of bottle caps. What looks to be an intricate and detailed map by an engineer is actually a hand-drawn pictorial history of a fictional planned community, with a census kept over time, hand-lettered in print so small that it doesn’t even register as text—at first. “I’ve only collected pieces that I’ve had an emotional connection to,” says Ludwig, and over time her collection has come to include works by some of the most highly regarded artists in this field. The Woolsey bottle-cap sculptures were discovered after the artists’ deaths and the lot of them sold for $57. Now they sell for $5,000, and more. For his part, Finster was commissioned by the Talking Heads to design the cover of their 1985 album, Little Creatures. The works of Leroy Almon and Mose Tolliver have been shown in the Smithsonian American Art Museum. Gregory Blackstock is a savant who speaks 14 languages and creates illustrated lists— Ludwig’s piece is of seamen’s knots—and his work now sells for as much as $8,000. Ludwig is generous with her collection, lending pieces to museums across the country, including the Historic City Hall Arts & Cultural Center in Lake Charles, La., the Muskegon Museum of Art in Muskegon, Mich., and the Kimball Art Center in Park City, Utah. The visceral response they elicit from viewers is part of what drives her to share. She relishes a little girl’s interaction with one of her pieces, Winged Man, by Homer Green. A wooden, totem-like figure nearly five feet tall, painted green, with outstretched wings and plastic googly eyes, it was shown at Kansas City’s Belger Art Center. Ludwig created and maintains a website, www.detourart.com, dedicated to the artists and the environments that influence their work. Her photographs of folk art environments have been shown at the Abby Aldridge Rockefeller Folk Art Museum in Williamsburg, Va., and the SFO Museum in San Francisco, Calif.
Brian Justice grew up in Kansas City. Now a Chicago-based writer he has written for Michigan Avenue, Interiors Chicago, Profile, Modern Counsel and GB&D magazines. Previous Post Kansas City Jazz Orchestra, under the direction of Clint Ashlock, presents the British Invasion!